Peter the Great was tall, genteel, well made, with a noble aspect, piercing eyes and a robust constitution, fitted for all kinds of hardship and bodily exercise. He had a sound understanding, which is the basis of all real abilities; and to this was joined an active disposition, which prompted him to undertake and execute the greatest things. The excellence of Robinson's 'History of Western Europe' has been attested by the immediate and widespread adoption of the book in many of the best schools and colleges of the country. It is an epoch-making text-book on the subject. 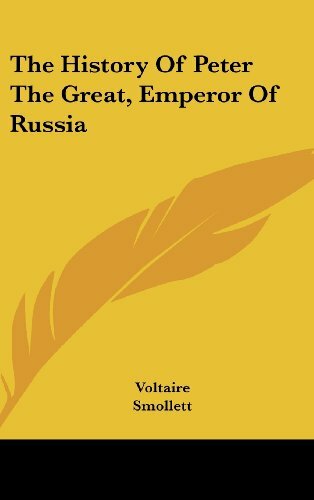 The aim in this book is to convey general impressions of the various stages passed through by Russia in the course of her evolution, and to give sketches of the lives of those rulers who have stamped their era with the mark of their personality. These essays, upon different phases of the drama which has made our lifetime memorable, would be unworthy of republication were it not that at such a time every smallest thing which may help to clear up a doubt, should be thrown into the scale. The Russian Revolution may be the most misunderstood and misrepresented event in modern history. Neil Faulkner sets out to debunk the myths from fiction, putting at the heart of the story the Russian people who are the true heroes of this tale.